Paul O’Bryan, a Delaware resident and one of the volunteers who has been mowing Fairview Memorial Park since it’s owners were indicted in February, mows the cemetery Thursday morning. 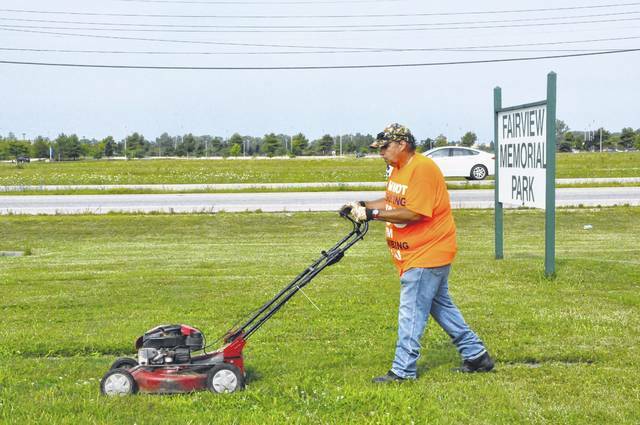 The receiver in charge of Fairview Memorial Park said Thursday that he has arranged for a group of volunteers to regularly mow and maintain the cemetery. A.C. Strip, Esq., a Columbus-based attorney specializing in corporate insolvency, was appointed to care for the cemetery by Delaware County Common Pleas Judge David Gormley at a hearing on May 29 and has filed two reports about the cemetery since then. As the receiver for the cemetery, Strip is responsible for maintaining the cemetery and organizing its finances so it can be sold. The owners of the cemetery, Theodore and Arminda Martin, are currently facing charges for engaging in a pattern of corrupt activity and dozens of theft charges in Delaware County Common Pleas Court for allegedly selling cemetery plots and other items to Delaware County individuals, but never following through with delivery and instead spending the money at a casino in Pennsylvania. Their trial is scheduled to begin Oct. 10. The Martins were indicted in February and when mowing season started, there was no one to maintain the cemetery. Delaware resident Paul O’Bryan then began mowing the cemetery and organizing a group of volunteers to handle mowing and maintenance. In May, O’Bryan said he had family buried in the cemetery and felt a responsibility to take care of it. Earlier this week, O’Bryan reported that while Strip was doing a great job handling the cemetery’s funds, he still had not taken care of maintenance and O’Bryan and his group were still the only ones mowing the cemetery. On Thursday, Strip said that he knew a lawn-care service had volunteered to mow the cemetery in June and assumed the lawn-care service was responsible for the continued maintenance at the cemetery. O’Bryan said that service only mowed the lawn once and the responsibility fell back on the volunteers. Strip said when he learned it was still just O’Bryan and a few others, he organized a group of volunteers to care for the cemetery. Strip acknowledged it was an error on his part and said he must give O’Bryan and the other volunteers credit for taking care of the cemetery. Strip reported that the cemetery’s account now has about $3,000, but said that money is reserved to hire a court-ordered appraiser. Strip said the money will also be used for real estate taxes and emergencies. Strip noted this is his fourth cemetery receivership and said in his experience, emergencies can come up in cases like this. On Thursday afternoon, O’Bryan said he had been contacted by Strip and told about the new group of volunteers. “It’s a good thing,” O’Bryan said. O’Bryan added that he will likely still volunteer to mow the cemetery, even if there is another group in charge. This entry was tagged fairview memorial park. Bookmark the permalink.